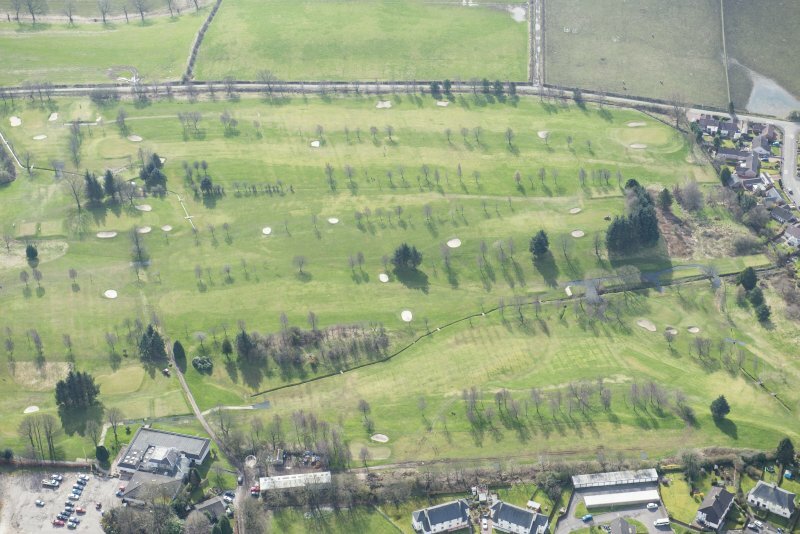 Oblique aerial view centred on the course of the Antonine Wall and the site of the adjoining Roman fort and possible Roman fortlet, taken from the SSW. 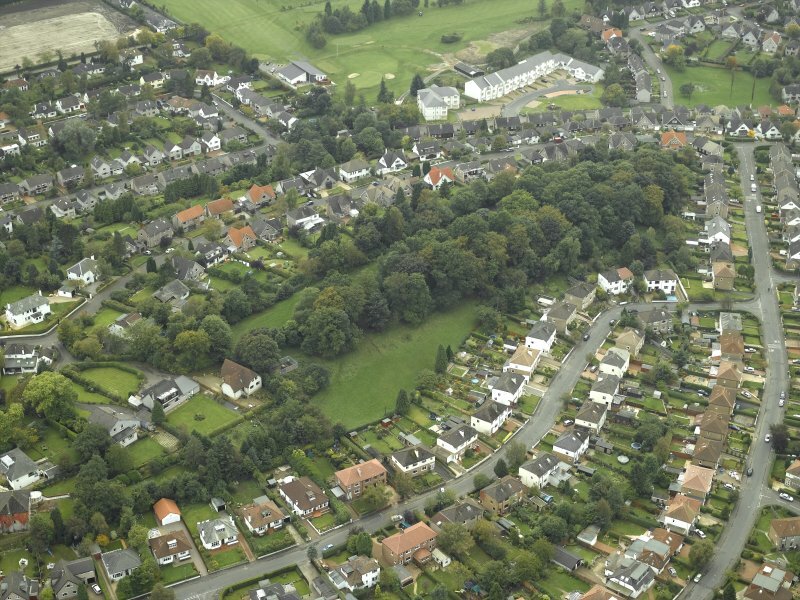 NE oblique aerial view of the course of the Antonine Wall at Bearsden. 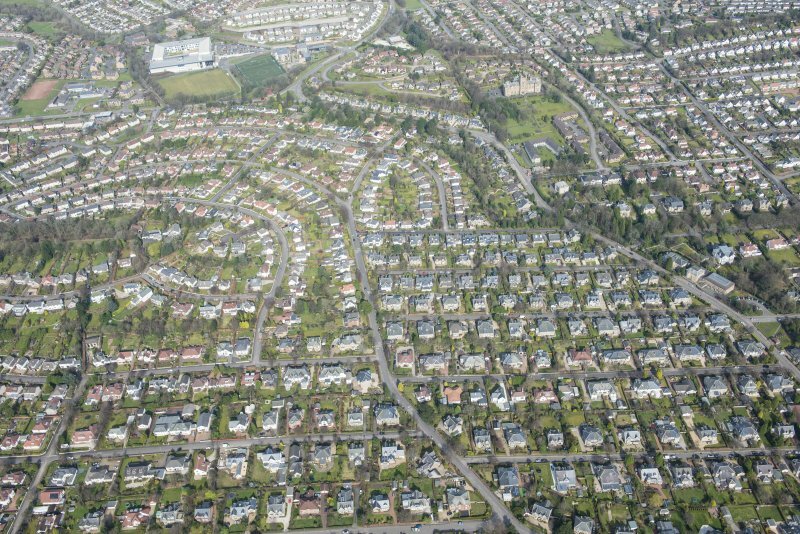 Oblique aerial view centred on the course of the Antonine Wall with the housing adjacent, taken from the ESE. 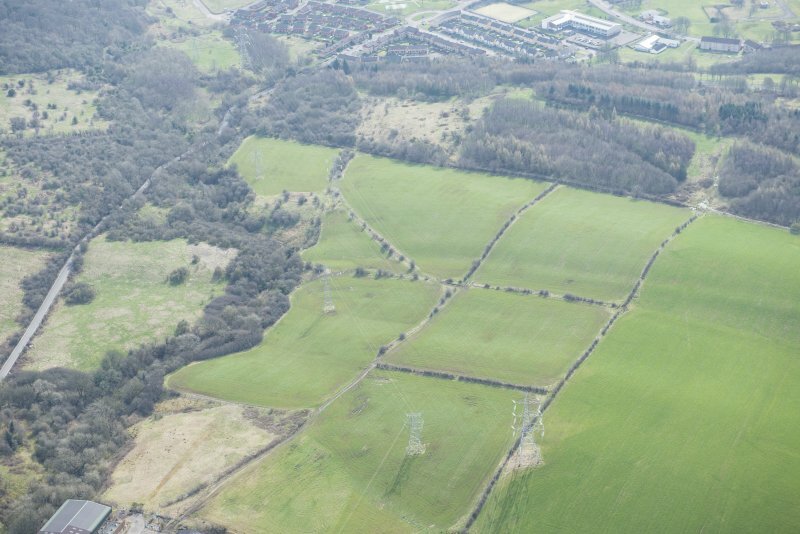 Oblique aerial view centred on the course of the Antonine Wall and the site of the adjoining Roman fort and possible Roman fortlet, taken from the NE. 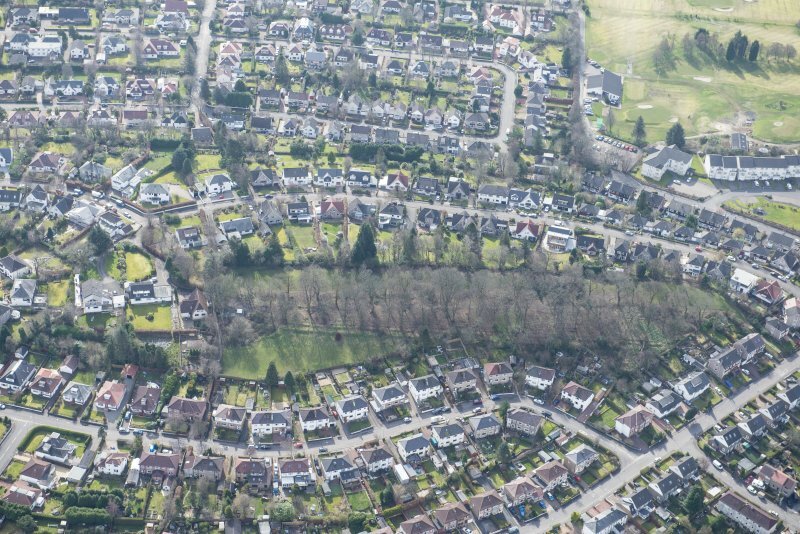 Oblique aerial view centred on the remains of the Roman fort and the course of the Antonine Wall, taken from the W.
Oblique aerial view centred on the course of the Antonine Wall and the site of the adjoining Roman fort and possible Roman fortlet, taken from the W.
Oblique aerial view centred on the course of the Antonine Wall and the site of the adjoining Roman fort and possible Roman fortlet, taken from the SSE. 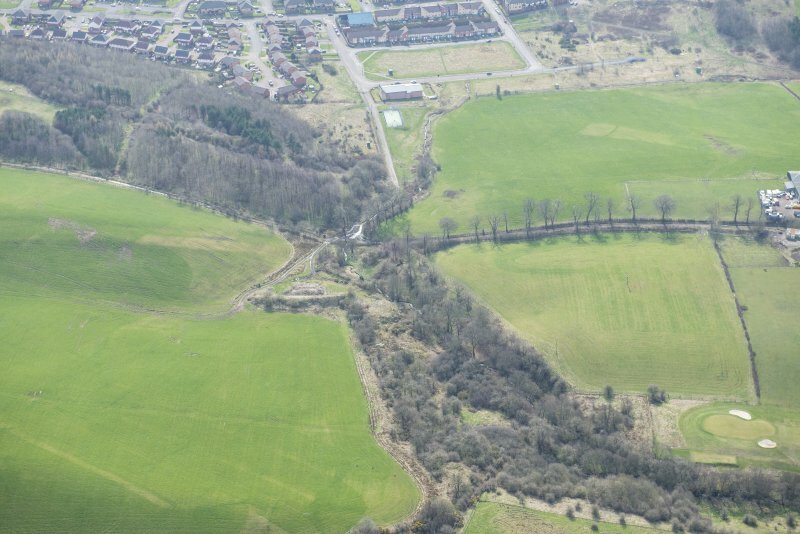 Oblique aerial view centred on the course of the Antonine Wall and the site of the adjoining Roman fort and possible Roman fortlet, taken from the ENE. 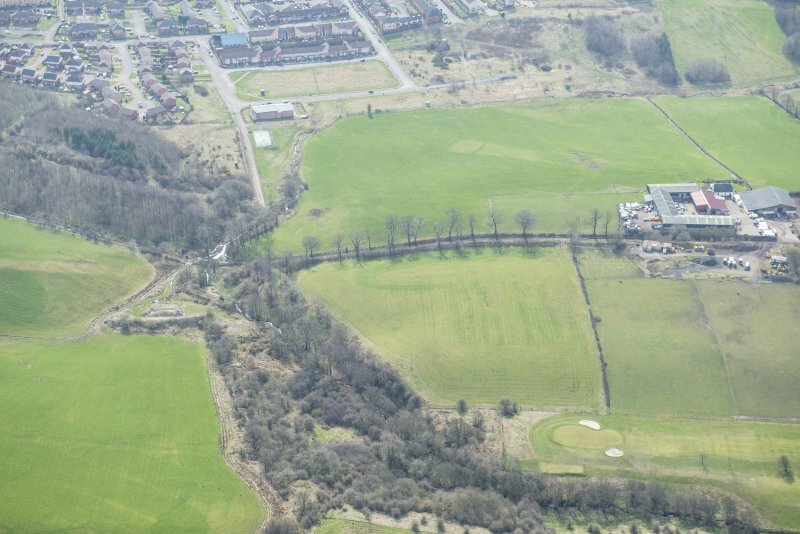 Oblique aerial view centred on the course of the Antonine Wall and the site of the adjoining Roman fort and possible Roman fortlet, taken from the ESE. For continuation to W, see also NS47SE 83.00. For Cleddens Farm (NS 51101 72241), see NS57SW 320. NS 5000 7239 to NS 5014 7232 The published survey (OS 50 inch 1963) was revised. 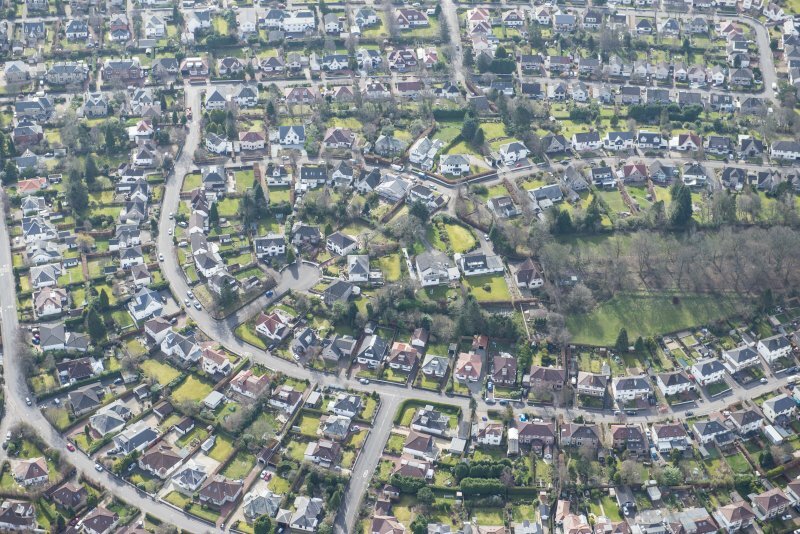 No trace across developed area. 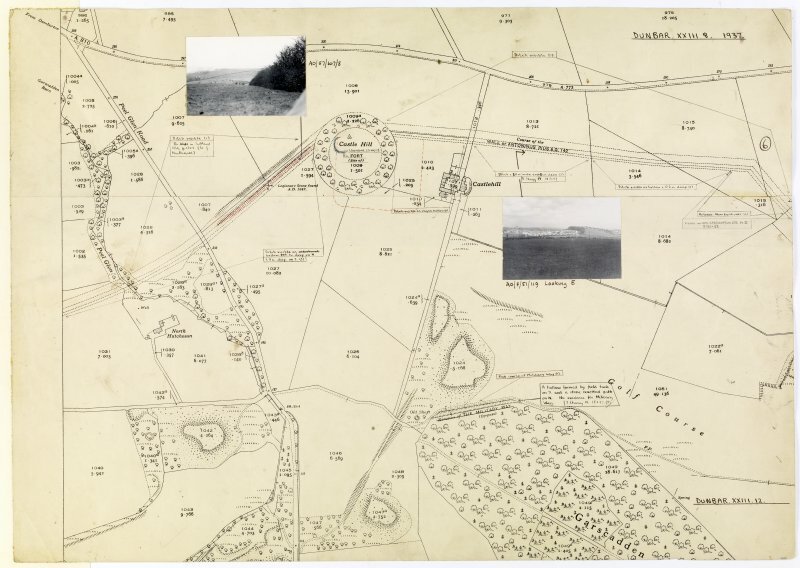 The line of the Ditch is shown on the 1st edition of the OS 2 and a half inch (Dunbartonshire 1862, sheet 23/11) and subsequent plans, and as late as 1957 a broad hollow some 25m wide and 0.5m deep was visible (Information from OS 1957). 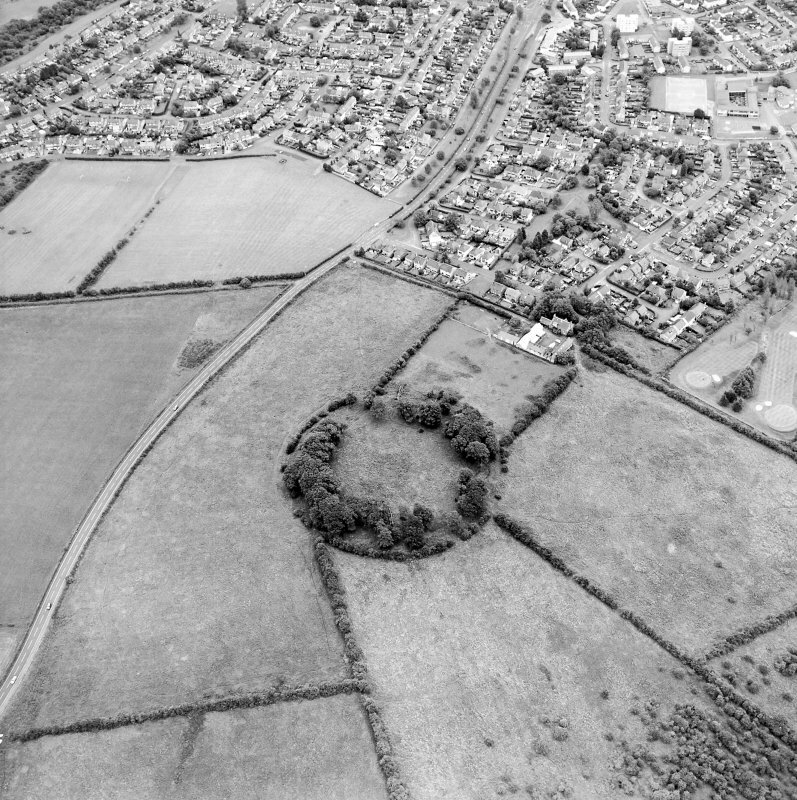 The course is distinct in RAF vertical aerial photograph (F22/ 58/ 2682, frame no 0094, 1959.) No trace of the Wall or Outer Mound was found. NS 5014 7232 to NS 5020 7229 The published survey (OS 50 inch 1963) was revised. 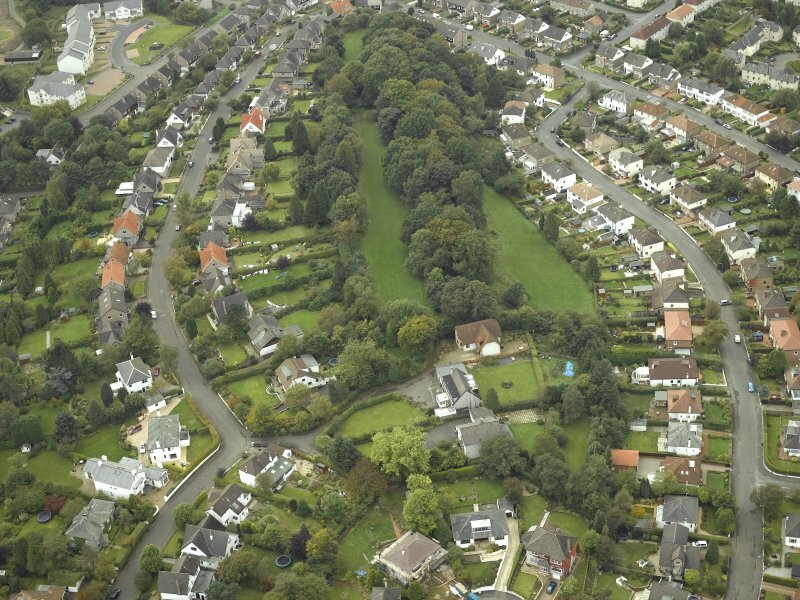 Amorphous hollow of the Ditch cuts across the golf course and is confused by landscaping. NS 5020 7229 to NS 5050 7228 The published survey (OS 50 inch 1963) was revised. The line is slightly adjusted to concur with excavation results at Cleddans fortlet (see NS57SW 50, see Grew 1980; Keppie and Walker 1980). The bank scarp is up to 1.5m high on the N side of the track, and probably on the S side of the Ditch. NS 5050 7228 to NS 5100 7228 The published survey (OS 50 inch 1972) was revised. Accepted line, based on partially extant course on the 1st edition of the OS 2 and a half inch (Dunbartonshire 1862, sheet 23/11), has been slightly adjusted in light of excavation evidence at NS 5083 7226 (see NS57SW 50). Excavation plans also show a probable sharp southward kink of the Wall at its eastern juncture with the fortlet (this detail has had to be omitted from the OS 50 inch 1972 map revision as it cannot yet be assimilated). NS 5083 7226 The line of the Wall was established in relation to Cleddans fortlet (NS57SW 50) during trial excavations in 1979 (Grew 1980; Keppie and Walker 1980). NS 5100 7228 to NS 5125 7228 The published survey (OS 50 inch 1957) was revised. Apart from amorphous hollow of the Ditch line, E of Cleddans farm, there are no extant traces; the S scarp of the Ditch is shown on the 1st edition of the OS 2 and a half inch 1862. The present farmtrack, following the line almost exactly, is slightly raised and must utilize the Outer Mound. NS 5110 7228 The Ditch passes to the N of Cleddans (Gordon 1726). NS 5125 7228 to NS 5150 7234 The published survey (OS 50 inch 1957) was revised. No trace of the Wall is visible across rough pasture. Alignment change indicated on pre- 1957 maps at NS 5125 7228, typically at a natural obstacle, is now reinstated. The line of the Ditch and Outer Mound are shown as mostly extant on the 1st edition of the OS 2 and a half inch (Dunbartonshire 1862, sheet 23/11). NS 5150 7234 to NS 5163 7239 The published survey (OS 50 inch 1957) was revised. The much-spread S scarp of the Ditch, up to 1m deep, and the N scarp of the Outer Mound are largely extant across rough pasture. No trace of the Wall. NS 5163 7239 to NS 5200 7245 The published survey (OS 50 inch 1957) was revised. The Ditch has now almost been ploughed out, crossing arable fields, but its line is clearly indicated at dips in hedge-lines. As late as 1957 it was measurable as a distinct hollow averaging 16m wide and 0.5m deep (Information from OS 1957). The extant line including the now emphasized alignment angle W of NS 5200 7245 is superbly shown on RAF vertical aerial photographs (F22/ 58/ 2682, frame no 0095-6, 1959.) No trace of the Wall or Outer Mound. NS 5200 7245 to NS 5204 7248 The published survey (OS 50 inch 1960) was revised. 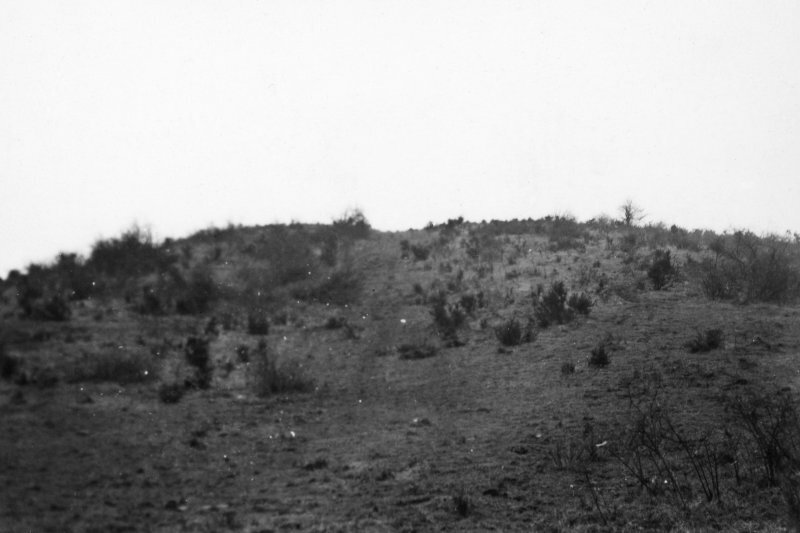 The line of the Ditch is visible as a vague depression in the pasture and as a pronounced dip about 0.5m deep at the top of the escarpment at NS 5204 7248. NS 5204 7248 to NS 5212 7254 The published survey (OS 50 inch 1960) was revised. No trace of the Wall at the deep Peel Glen. The established line to the E and W indicates a typical alignment change at or very near this natural obstacle. NS 5212 7254 to NS 5221 7258 The published survey (OS 50 inch 1960) was revised. 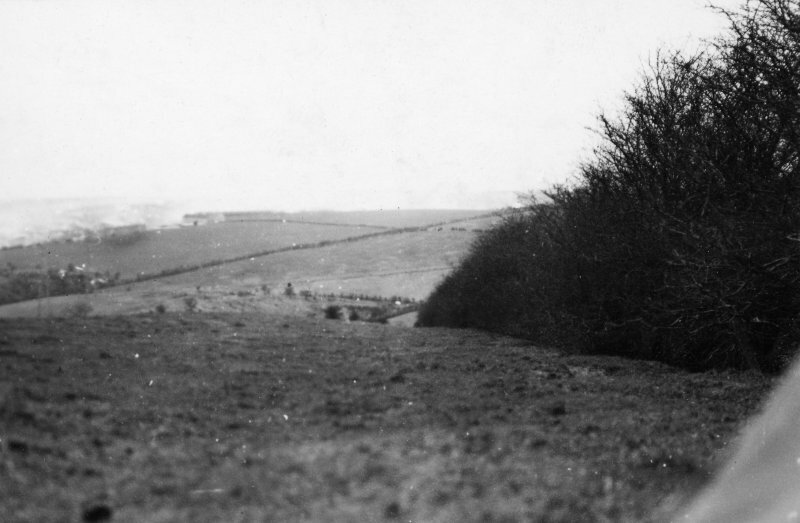 The line of the Ditch can be traced as a terrace and vague depression from a probable alignment angle 50m W of road (NS 5212 7254). NS 5221 7258 to NS 5235 7270 The published survey (OS 50 inch 1960) was revised. The Ditch, bisected by a hedgerow, is spread to a width of 19m with a N scarp 1.2m high and a S scarp 1.8m high. No trace of the Wall or Outer Mound. Resurvey emphasizes slight alignment angle at NS 5221 7258. NS 5235 7270 to NS 5250 7272 The published survey (OS 50 inch 1960) was revised. No trace of the Wall is visible across the plantation enclosure. NS 5250 7272 to NS 5261 7271 The published survey (OS 50 inch 1974) was revised. The line of the Ditch is evident as a terrace, gradually merging with a hedge-line. Across a pasture field, the alignment angle at NS 5261 7271 indicated on pre-1967 OS plans, is clearly visible. NS 5261 7271 to NS 5286 7266 The published survey (OS 50 inch 1974) was revised. 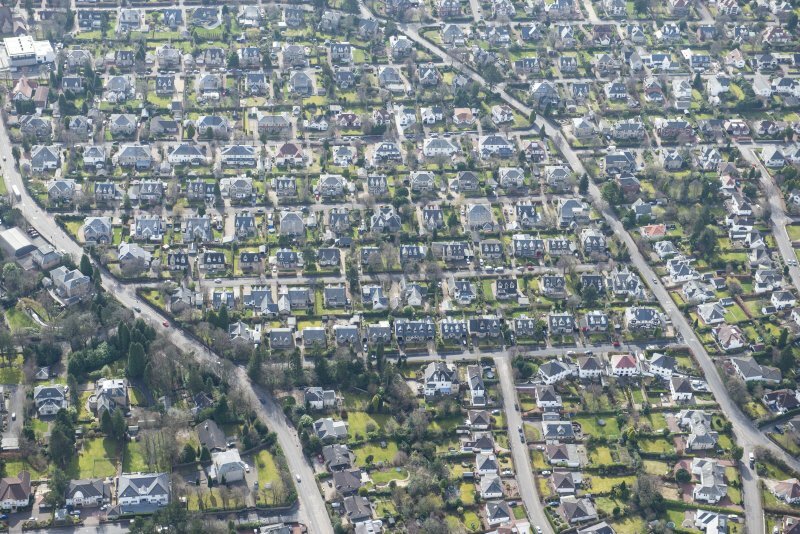 Housing development conspicuously avoids the line of the Wall with a path and greenway indicating the total width and course. The Ditch is traceable as a 0.4m deep hollow for most of its length. NS 5286 7266 to NS 5300 7665 The published survey (OS 50 inch 1974) was revised. 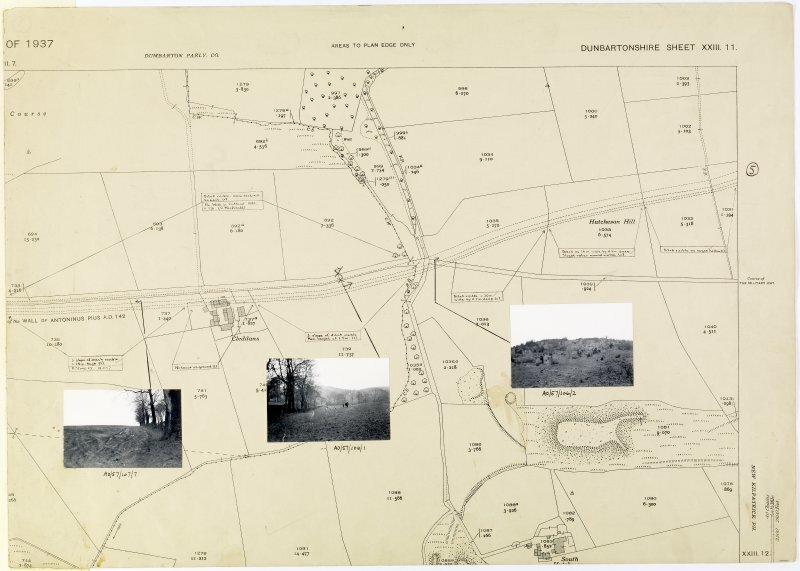 No trace of the Wall across developed area; the line appears straight (see CUCAP aerial photograph U60) between established alignment angle at NS 5309 7265 and the re-introduced angle at NS 5286 7266, shown on the 1st edition of the OS 2 and a half inch (Dunbartonshire 1862, sheet 23/8) and subsequent plans. NS 5300 7665 to NS 5321 7250 The published survey (OS 50 inch 1970) was revised. 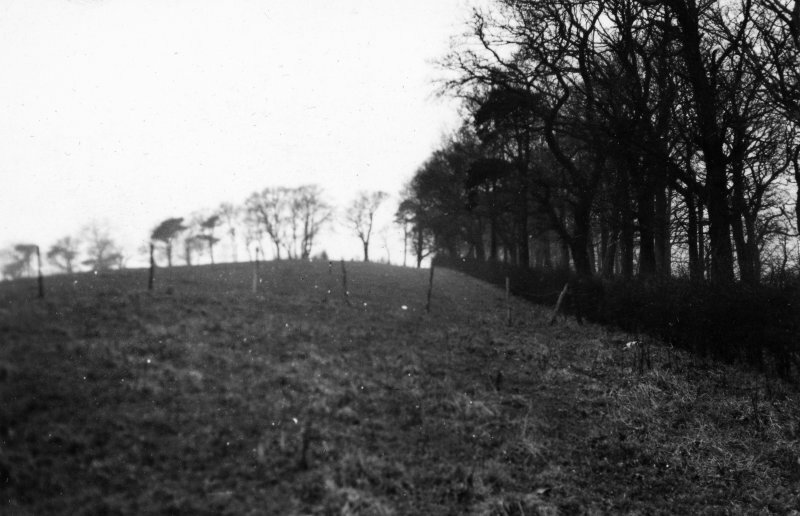 No ground remains, apart from a spread linear mound, about 0.7m high, traversing the N side of the football ground E of NS 5300 7665. This corresponds with the accepted line of the Rampart (Macdonald 1934) and the pecked course as shown on the 2nd edition of the OS 2 and a half inch map (Dunbartonshire 1918, sheet 23/8 and 23/12). 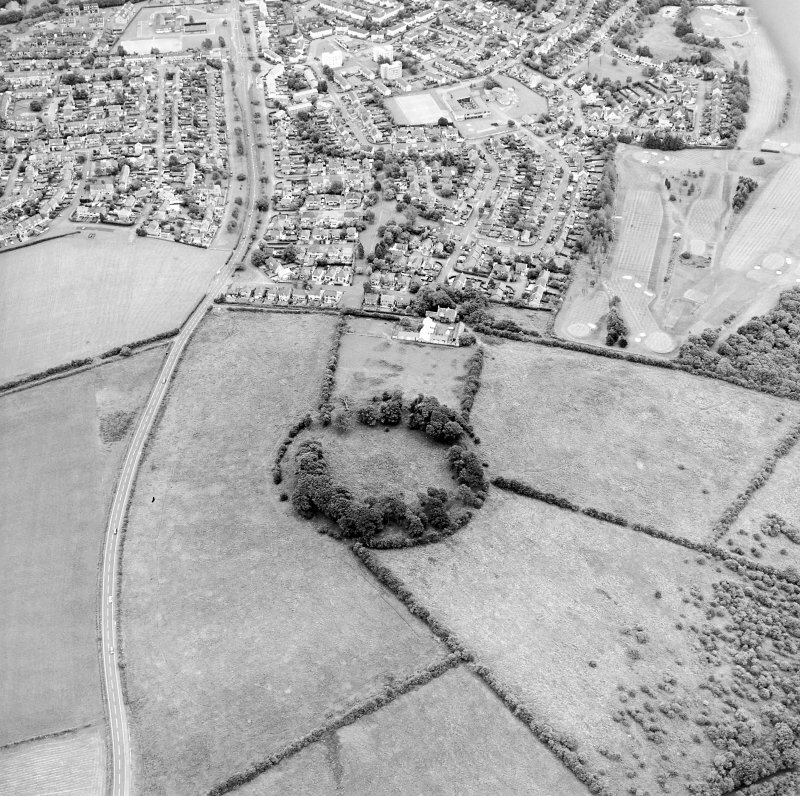 The only pre-development aerial photograph available for this sector (CUCAP aerial photograph U60) shows the line and alignment angle but at a distance too great for exact observation. 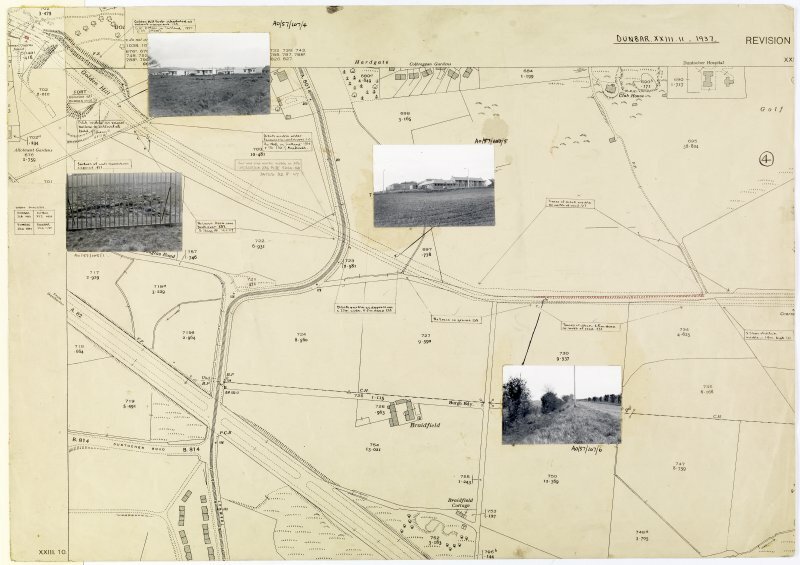 Available RAF aerial photographs (1959) post-date the development in this sector. NS 5317 7258 The Ditch is fairly deep but becomes shallower (Macdonald 1934). NS 5321 7250 to NS 5334 7244 The published course (OS 50 inch 1965) was resurveyed in accordance with detail on the 2nd edition of the OS 2 and a half inch map. A sharp directional change to the NW is dictated by the contours but it is probable, as indicated on the above survey, that the angle of the turn was lessoned by a short straight. This may have been necessary in view of the steep drop immediately to the S, but the theme appears to have occurred elsewhere on the line (e.g. W of Castelcarry). NS 5334 7244 to NS 5350 7244 The published course (OS 50 inch 1965) was resurveyed. 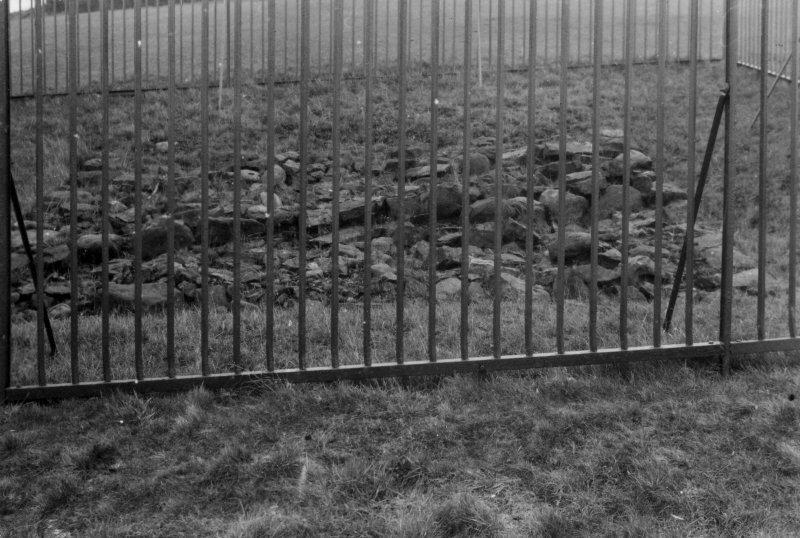 Across an open park area a double line of concrete stones marks the course of the Wall and leads to a railed enclosure displaying a 10m length of Wall base uncovered by excavation at NS 5336 7244. NS 5336 7244 The Ditch was cleared and the base of the Wall was exposed for display in 1963/4 during excavations on behalf of Bearsden Parks Dept (Robertson 1963, 1964). NS 5350 7244 to NS 5400 7210 The published course (OS 50 inch 1961) resurveyed. At NS 5373 7235 a 4m length of the N kerb is exposed behind a garage. The 3m length of the exposed Wall at NS 5385 7223 is as described. Both portions surveyed at 1:1250. The new line is based on the above evidence and the largely extant detail shown on the 1st edition of the OS 2 and a half inch map (Dunbartonshire 1863, sheet 23/12), with which it is in complete sympathy. NS 5373 7235 The kerb of the Wall is exposed at 8 Milverton Ave (Information from Keppie 1980). NS 5379 7233 The Ditch is plainly visible running NW (Macdonald 1934). 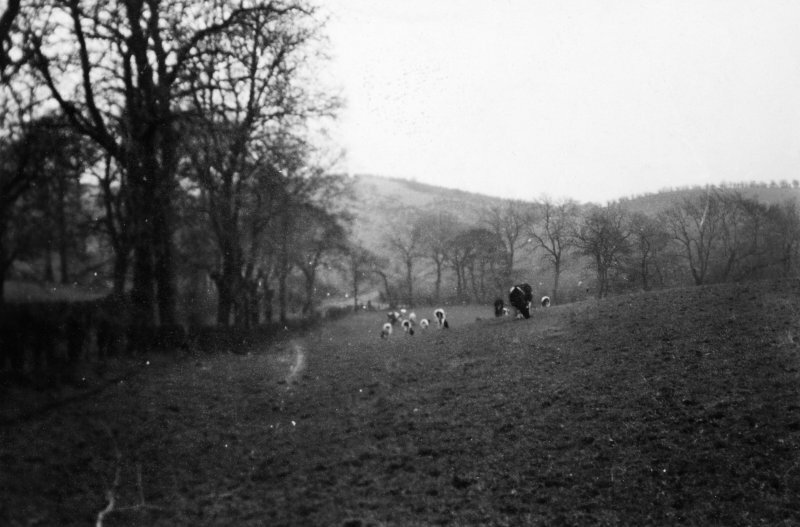 Track of the Ditch is easily followed between Thorn and Ferguston Muir (ONB 1860). NS 5383 7223 A small portion of the Wall including the S kerb is exposed at 4 Thorn Drive, and made into a garden feature (Keppie 1974). NS 5400 7210 to NS 5423 7211 Published course (OS 50 inch 1966) resurveyed. No ground remains apart from an 8m length of Wall base that remains exposed in a garden at NS 5419 7209. Probing immediately W of these remains reveals a slight alignment angle. The new line is based on this evidence and the extant line of the Ditch shown on the 1st edition of the OS 2 and a half inch map (Dunbartonshire 1863, sheet 23/16) with which it is in sympathy. NS 5419 7209 The Wall base is uncovered in the garden of 10 Thorn Road in 1973. 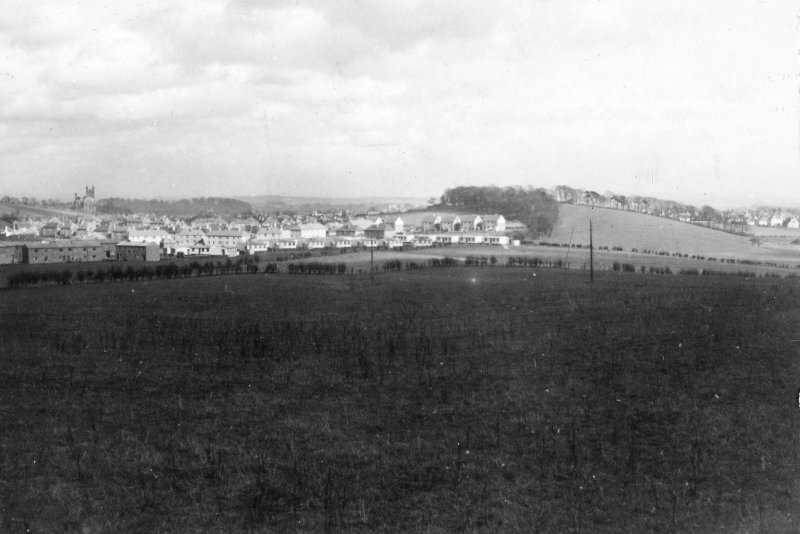 The line is about 23m S of that given by Macdonald (1934) (Keppie 1973). NS 5423 7211 to NS 5442 7213 Published course (OS 50 inch 1966) resurveyed. No surface indications, and no known extant survey of the course. It is noticeable that the projected line from the known position at NS 5423 7211 is likely to be on, and parallel with, New Kirk Road and to continue to an obvious alignment angle at a sharp change in slope at NS 5436 7215. The line should then continue straight to NS 5442 7213. NS 5442 7213 to NS 5450 7214 Published course (OS 50 inch 1966) resurveyed from the evidence at NS 5385 7223 and consultation with Dr. D J Breeze. There is no surface trace of the Wall or Ditch, but it is apparent that the Ditch line has been eroded by the steep scarp above Manse Burn. 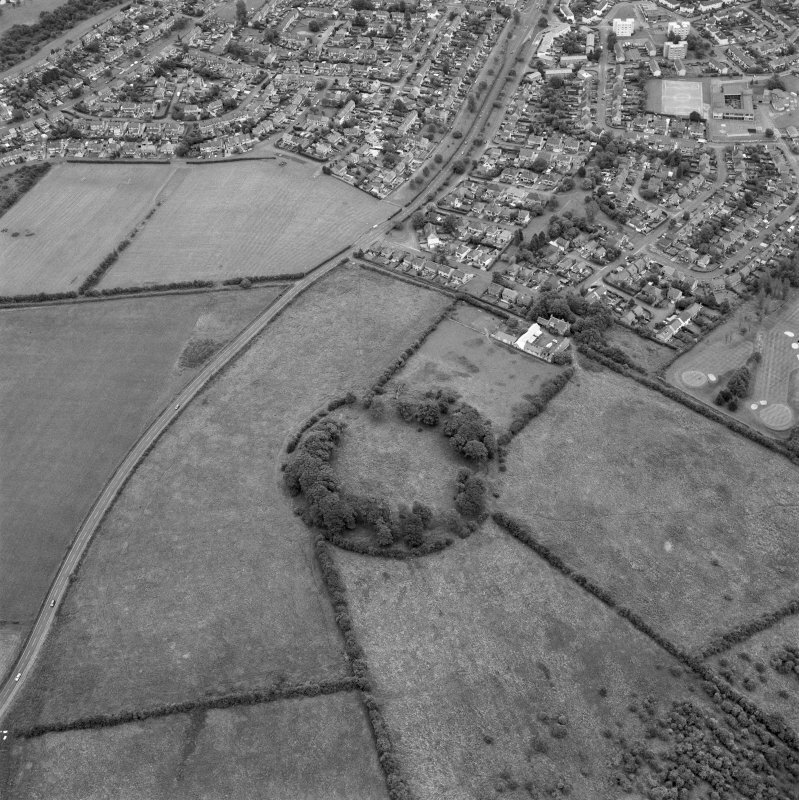 NS 5448 7213 The course of the Wall and Ditch has been determined by excavations at Bearsden fort (NS57SW 3) from 1973 onwards (Breeze 1974). NS 5450 7214 to NS 5470 7211 Published course (OS 50 inch 1967) resurveyed from the evidence at NS 5450 7214 to NS 5468 7211 and consultations with Dr. D J Breeze. This area is now being redeveloped. See also NS57SW 3. NS 5450 7214 to NS 5468 7211 The course of the Wall and Ditch (eastwards to Grange Road) was determined by excavations at Bearsden fort (NS57SW 3) from 1973 onwards (Breeze 1974, Wilson 1974). NS 5470 7211 to NS 5488 7204 Published course (OS 50 inch 1967) resurveyed. There is no ground trace and no known survey of an extant course. The new line is based on a direct link between known points. It is the most likely based on topographic evidence and the alignment angles at NS 5470 7211 and NS 5488 7204 which are placed at the optimum sighting and change of slope positions. NS 5479 7207 East of Bearsden fort (NS57SW 3) the Wall turns ESE and crosses Furguston Burn (? Now Manse Burn). The Wall and Ditch are entirely lost in this area but the Military Way is well preserved (Horsley 1732). NS 5488 7204 to NS 5500 7996 Published course (OS 50 inch 1967) resurveyed as per NS57SE 42.00 (at NS 5500 7198 to NS 5518 7200). The sharp alignment angle at NS 5499 7196 is necessary to maintain ground advantage, and can be deduced from the 1st edition of the OS 2 and a half inch map (Dunbartonshire 1863, sheet 23/16). 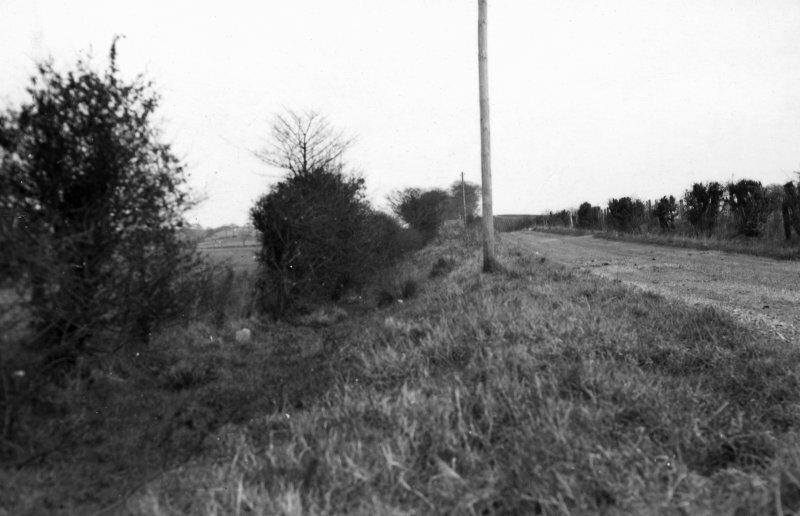 The new line now runs exactly parallel with Roman Road; evidence which further supports Macdonald's (1934) line for the Military Way (see NS57SW65.13). A stretch of the Antonine Wall base in a fine state of preservation was uncovered in the garden of 10 Thorn Road, just over 0.3m from the modern surface. Both kerbs were located and some traces of turf observed; the width of the base was 4.5m. Elsewhere in the garden is ditch-filling to a depth of at least 1.85m. The stone base is located c.23m S of the line shown by Macdonald (1934). A piece of diamond-patterned worked sandstone suggestive of Roman workmanship is in the Hunterian Museum. L J F Keppie 1973; D R Wilson 1974. A small portion of the Antonine Wall base, including the S kerb, has been exposed for some years at 4 Thorn Drive, where it is incorporated as a garden feature. L J F Keppie 1974. NS 508 723 A fortlet (NS57SW 50) was located by trial trenching, the eighth to be found on the Wall (see also NS98SE 82 and NS98SE 15). It preceded the Wall, for at the NE corner the stone base of the Wall abutted the existing fortlet rampart at a sharp angle. The course of the Wall could only tentatively be established, but a band of cobbles 20m from the fortlet, probably part of the core of the Wall-base, may indicate that it followed a roughly E-W alignment. In this case the Wall would have joined the fortlet rampart some way S of its NW corner. A rough circular hearth found near the cobbling probably lay just beyond the Wall to the N. A parallel of this feature can be observed at Bantaskin (NS87NE 57.00: NS 8728 8000) (Keppie 1978). F O Grew 1980; L J F Keppie 1978. NS 521 725 A length of 40m of the stone base of the Wall was totally excavated, prior to a road development. The base proved to be badly disturbed by ploughing, and survived intact only over a distance of 12m. The base had a width of 5m. Running parallel to it, 1m S of its S kerb, was a U-shaped channel, presumably for drainage. To the N was the Antonine Ditch, here with a width of 7m and a depth of 2.5m, separated from the stone base by a berm of 8.6m. The upcast, c.9.5m wide, thrown out on its N side, served to heighten the N face artificially. Sponsor: Scottish Development Department (Inspectorate of Ancient Monuments). L J F Keppie 1982; S S Frere 1983. 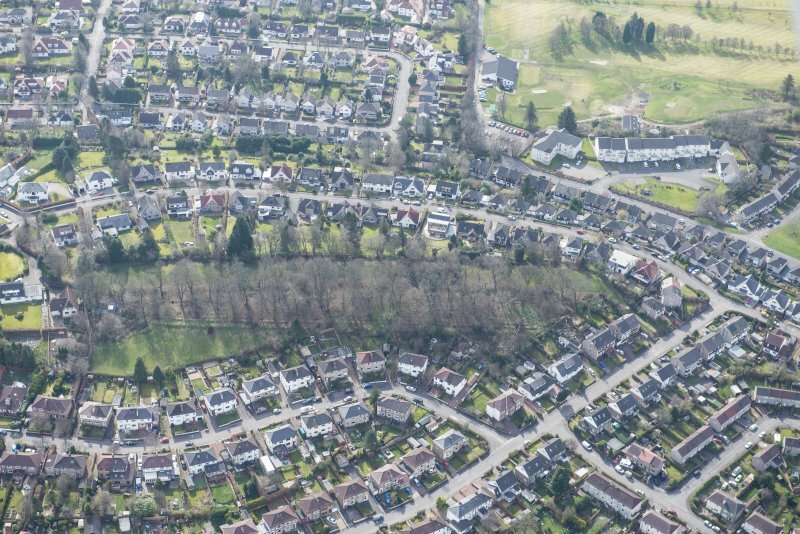 A length of 40m of the stone base of the Antonine Wall was totally excavated prior to a road development, The base proved to badly disturbed by ploughing and survived intact only over a distance of 12m. The base had a width of 5m. Running parallel to it 1m S of the S kerb was a U-shaped channel, presumably for drainage. To the N was the Antonine ditch, here with a width of 7m and a depth of 2.5m, separated from the stone base by a berm of 8.6m. The upcast on the N side served to heighten the N face artificially. L J F Keppie 1982. 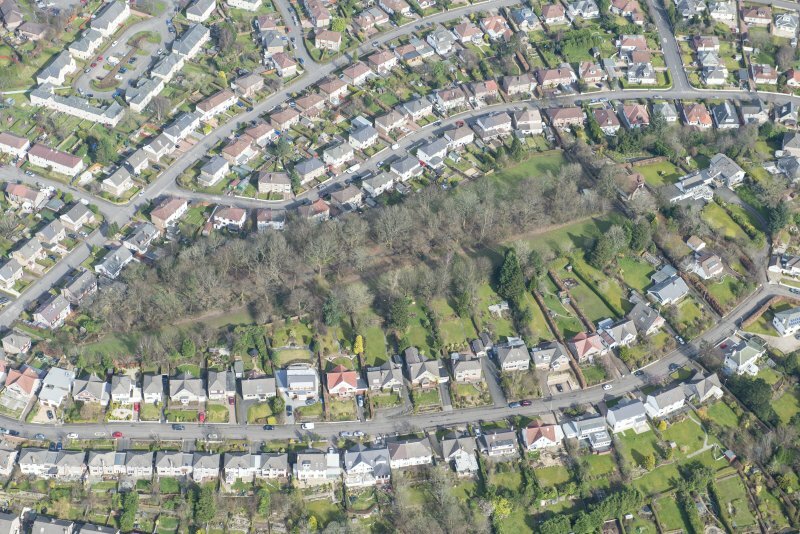 The buildings of a house-extension at 12 Thorn Road included the cutting of foundation and drainage trenches N-S across the likely alignment of the Antonine Wall. Some stonework was observed in section, but the base seemed already to have been much disturbed. L J F Keppie 1988. 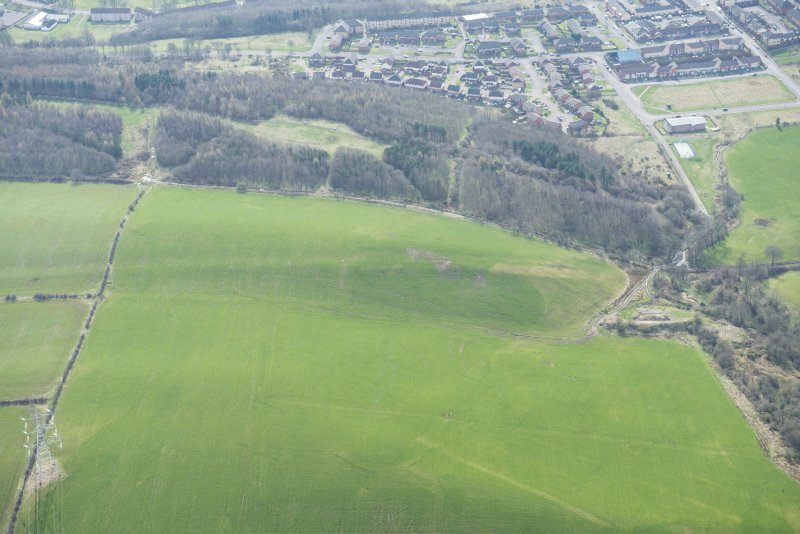 During construction work, a deep cut was made into the natural clay on the presumed line of the Antonine Wall and ditch, 100m W of the NW corner of Bearsden Roman fort (NS57SW 3). No trace of the stone base of the wall was observed. The S lip of the Antonine ditch was pinpointed in two N-S drainage trenches cut close to the existing church and by the W boundary wall of the site, where the ditch alignment is confirmed by cracking in the wall itself. These observations confirmed the line of the Antonine ditch as shown on current OS large-scale maps. 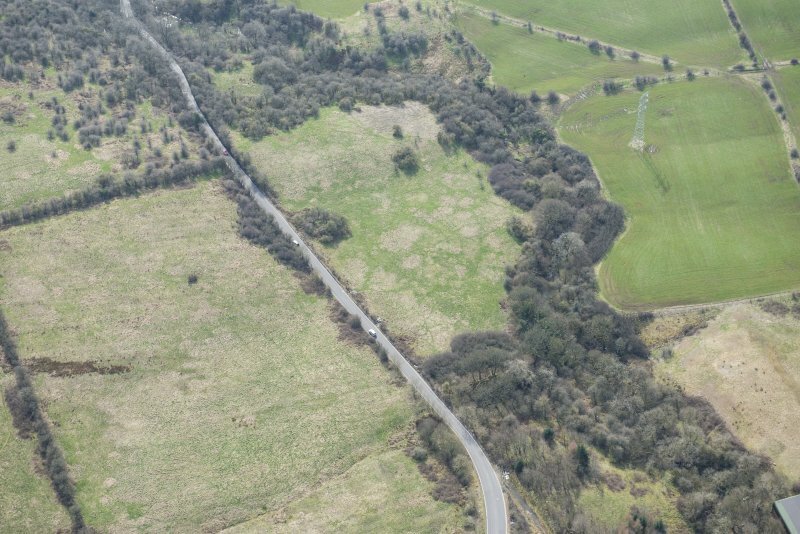 A watching-brief by P Robins of Strathclyde Regional Council, on the line of the Wall, revealed a spread of redeposited stonework overlying plough-soil from which post-medieval pottery was recovered. Some fragments of black-burnished ware were also retrieved. NS 5474 7209 SRC carried out a watching brief during excavation of foundation for an extension to the N and E of the existing house at 39, Roman Road, Bearsden. The OS 1:10, 000 map (dated 1985) shows the course of the Antonine wall running WNW to ESE passing the N side of the house whilst other maps held by the occupier and the Hunterian museum, indicate the wall pasing the southern side of the house. The foundation trenches revealed a small spread of large stone consistent with the make up of the base of the wall in other areas nearby. There were no traces of kerb stones evident. This feature was overlying a plough soil from which nine fragments of post-medieval pottery were recovered. The first edition of the OS maps dated c. 1860 shows the area as fields and it is likely thsat the plough soil noted in the foundation trenches belongs to this date. The spread of stones may represent clearance from an agricultural field or be related in some way to the construction of the house or its garden. Six sherds of black burnished Roman pottery from two different vessels were found in a garden soil that may have been bought in from elsewhere to level the garden. A full report has been deposited in the Strathclyde SMR. Drains were dug across the line of the Antonine Wall in 1988. The base appeared to have been already much disturbed. Scattered stones noted on the spoil tips, possibly deriving from the base, were mixed with modern rubble. L J F Keppie et al 1995. 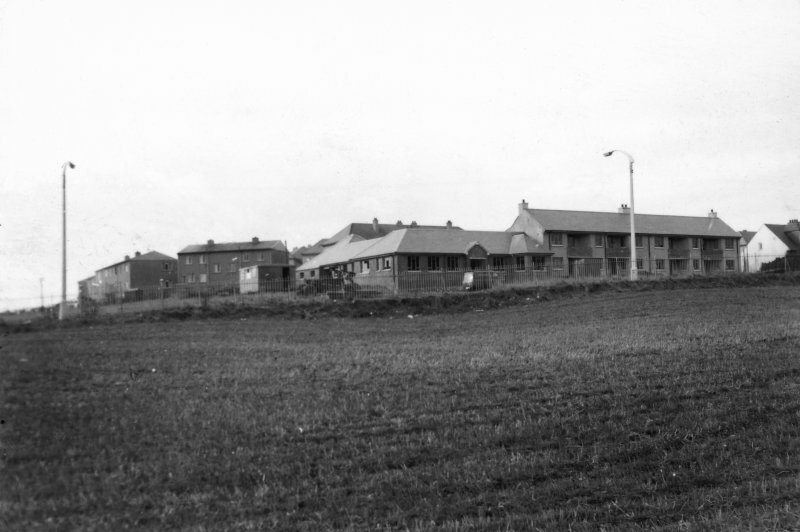 During March 1995, GUARD were commissioned to excavate a trench at the above location before the construction of farm buildings adjacent to the scheduled course of the Antonine Wall. The trnch measured 45m by 1.5m and up to 1m in depth and was positioned at 90 degrees to the adjacent scheduled area. Throughout the entire exercise no archaeological deposits or finds of any significant were encountered. 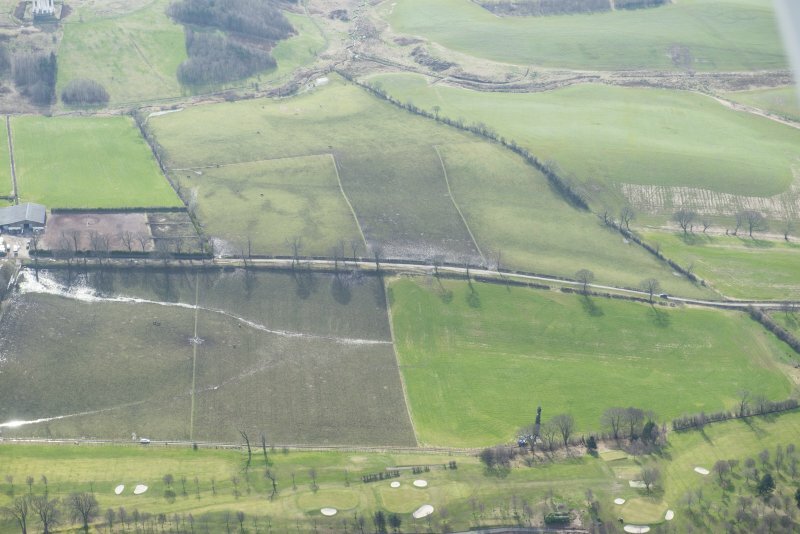 Excavation in advance of the construction of farm buildings immediately S of the Antonine Wall yielded no information; the ground was already much disturbed. NS 5047 7229 (centre) An archaeological evaluation was conducted on the line of the Antonine Wall at Cleddans Road, in advance of the laying of an underground electricity cable. 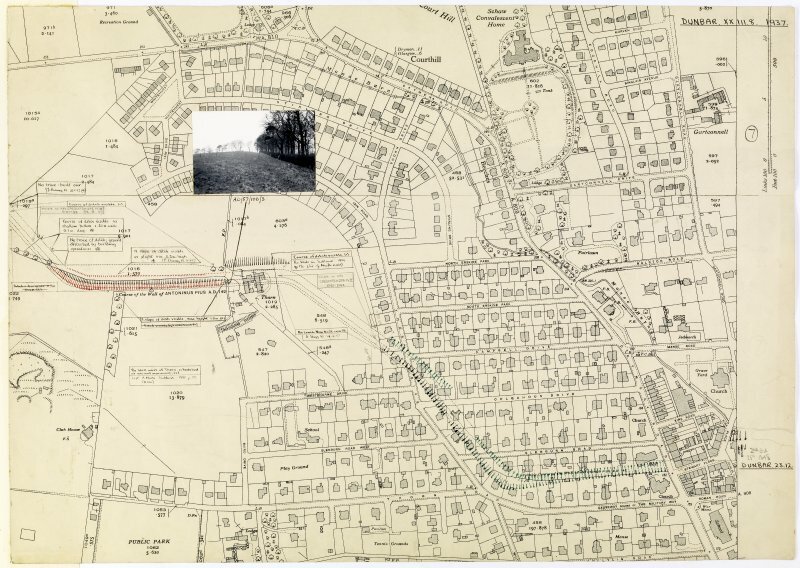 Two trenches were excavated on either side of Cleddans Road running from the S limit to the N limit of the Scheduled area, although Cleddans Road itself was not excavated. 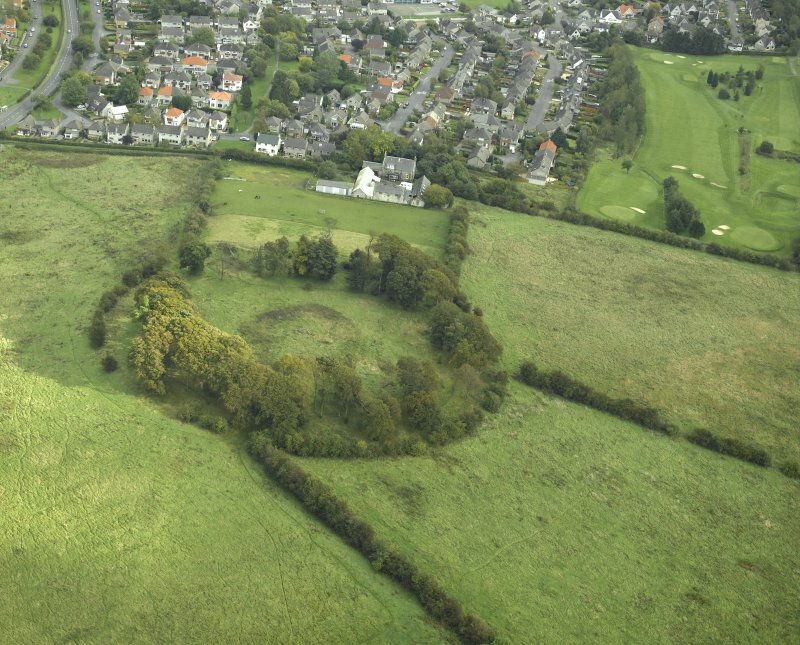 The presence of the rampart and military way was confirmed to the S of the road and the excavations confirmed the presence of the N edge of the ditch and the outer mound N of the road (within the Clydebank and District Golf Course). 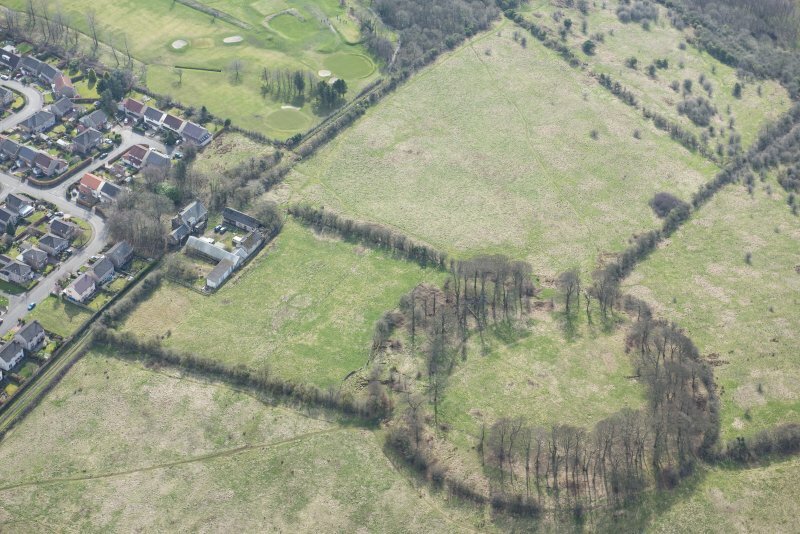 The rampart was located 1.9m to the S of the field boundary, with the military way located c 18m to the S of it. The base of the rampart measured 5m wide and was formed of two parallel kerbs of single-coursed, large angular blocks of yellow sandstone, between which was contained a foundation deposit of medium to small-sized angular sandstone cobbles. The turf component of the rampart was located immediately above the cobble foundation base and kerbstones and was 0.28m deep. Deposits of collapsed turf were identified immediately N and S of the rampart, in the latter area also sealing an old ground surface. The military way comprised a slightly concave depression, c 4m wide by 0.1m deep, which contained a spread of small to medium-sized pebbles. A narrow ditch measuring c 0.35m wide by 0.29m deep was present immediately to the S of, and running parallel to, the stone surface. The N cut of the ditch was present c 1.8m N of the fence on the N side of Cleddans Road, with the outer mound located c 2m N of the ditch. The ditch was excavated to a depth of c 0.75m below subsoil level. The rest of the ditch appears to lie beneath Cleddans Road. 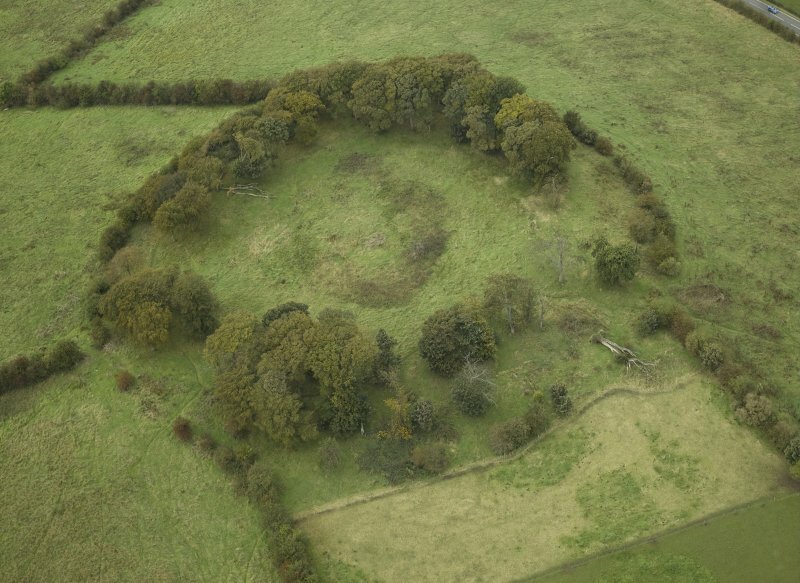 The outer mound measured 11m wide and survived to c 0.24m high, sealing beneath it an old ground surface. 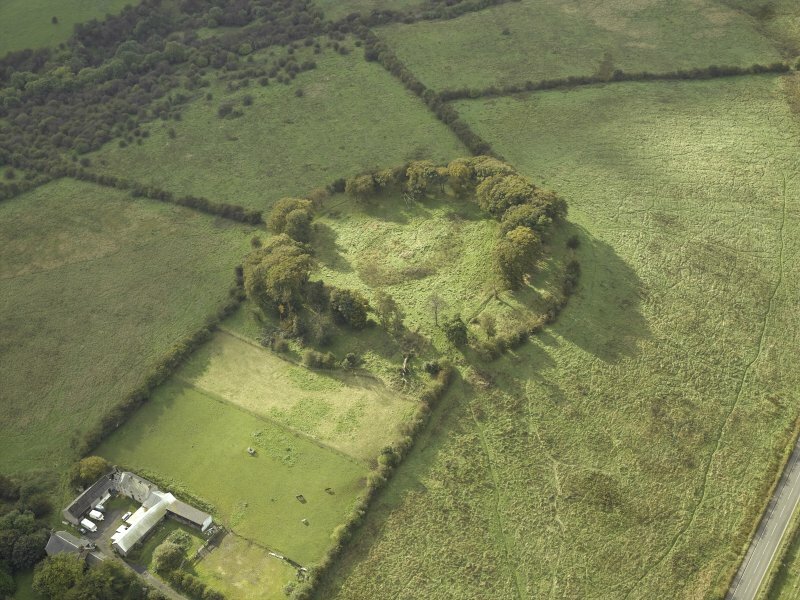 Two slots were located cut into the summit of the outer mound, c 0.9m apart, but are likely to be of relatively modern date. Further archaeological work was carried out in advance of construction work on cable-related features within the Scheduled area to the S of Cleddans Road. The excavation identified vague traces of the military way, comprising a patchy spread of small pebbles almost 4m wide. 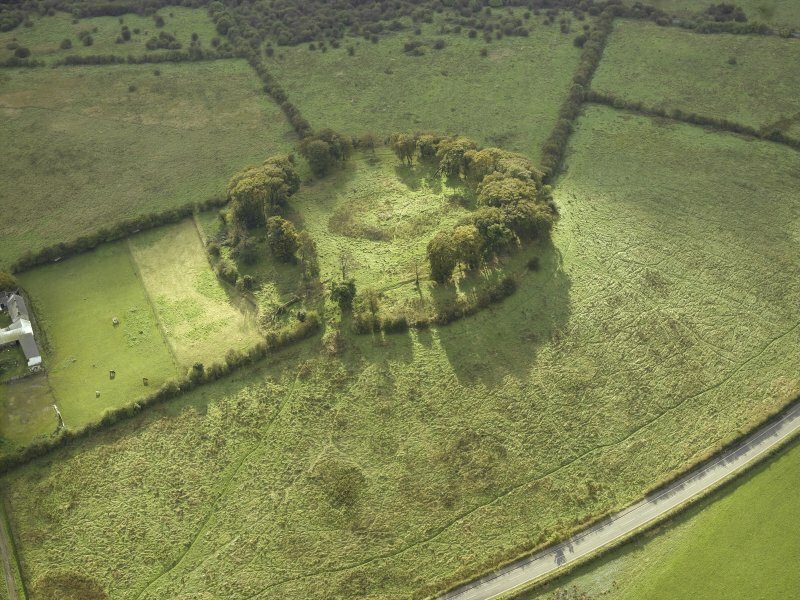 Two poorly defined carbon-rich spreads were located to the N of the military way. No further archaeological remains were recorded within these trenches. 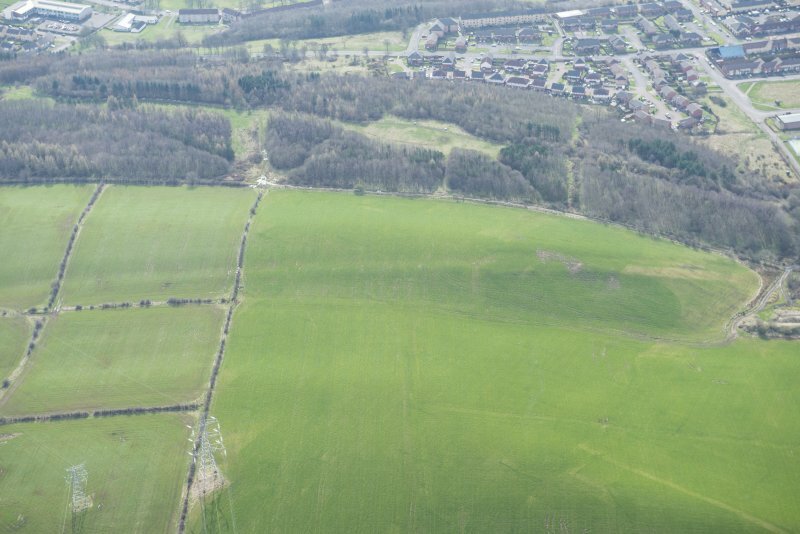 A watching brief was conducted during the excavation of a cable trench which ran parallel to the presumed alignment of the Antonine Wall features, immediately S of the Scheduled area, westwards to NS 502 722. No features of archaeological significance were identified. All finds recovered were modern or pre-recent in date. NS 505 723 Excavation in advance of proposed cable-laying revealed, S of Cleddans Road, the disturbed remains of the Military Way (NS57SW 65.13) and the stone foundation cobbling of the Wall, and, N of Cleddans Road, the N edge of the ditch and the Outer Mound. The stone base was 5m wide, with the turf superstructure surviving up to 0.28m high with some indication of the dimensions of individual turf blocks. 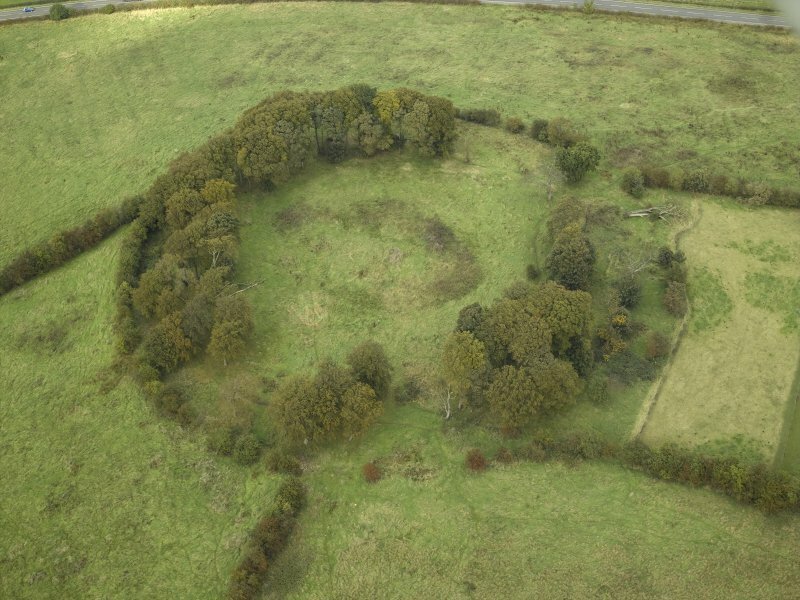 The Outer Mound had a width of c.11m, and survived to a height of c.0.24m. NS 512 723 During March 1995, GUARD were commissioned to excavate a trench at the above location before the construction of farm buildings adjacent to the scheduled course of the Antonine Wall. The trnch measured 45m by 1.5m and up to 1m in depth and was positioned at 90 degrees to the adjacent scheduled area. 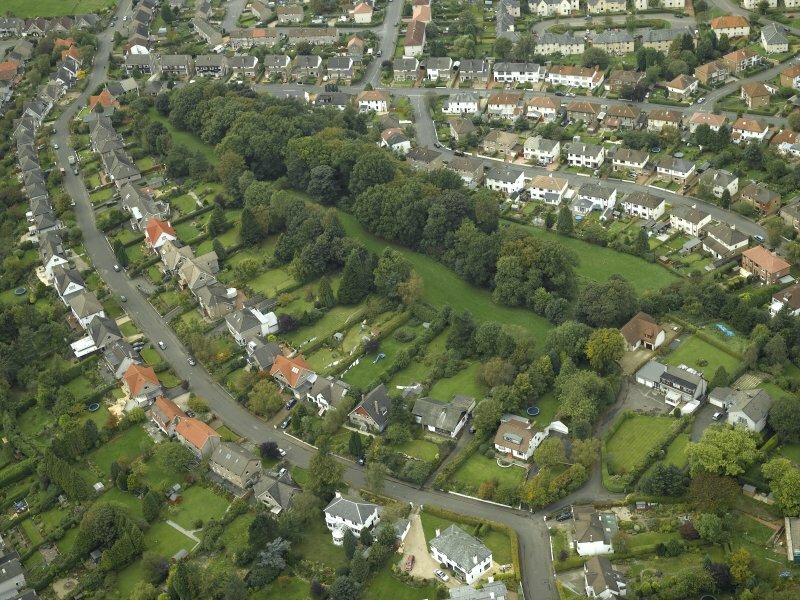 An evaluation within a proposed house plot at 18 Ballaig Avenue, Bearsden, revealed the N edge of the main ditch of the Antonine Wall surviving as a plough-truncated feature running E-W through the plot at its S frontage, at a depth of 0.95m below the modern surface, on the expected alignment. No remains of archaeological significance were encountered to the N of this feature. L J F Keppie 1998; K Speller 1997. NS 5352 7245 and NS 5353 7245 Two trenches were opened by GUARD in September 1997, ahead of a proposed single house development, to locate and evaluate the condition of any surviving remains of the Anotnine Wall. Some indication of the likely condition and characteristics of the Wall at this point was provided by records of an excavation conducted immediately W of the site in 1963 (Robertson 1964) (see NS57SW 65.00 at NS 5336 7244). A small portion of the Rampart base revealed that work can still be seen today exposed on the ground. 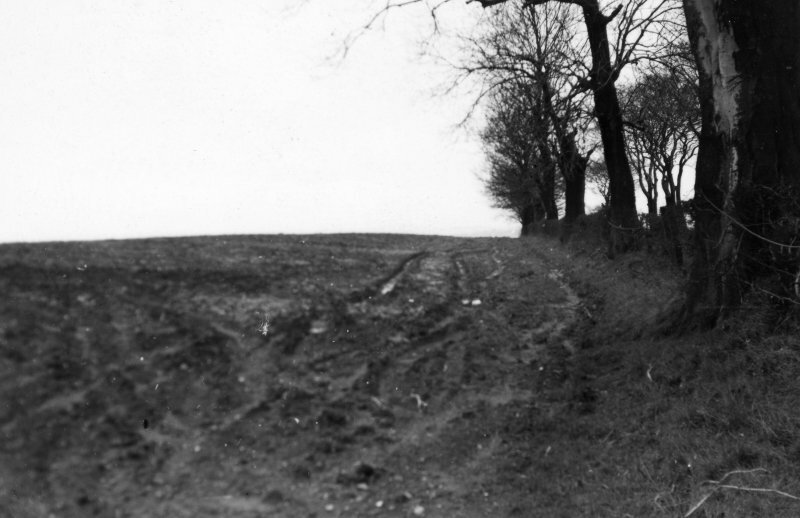 Trench 1 revealed that the Ditch survived more or less in the location anticipated. Although not fully excavated, thereby precluding measurement of its surviving width, a section cut into the Ditch fills demonstrated the features to have a step-cut profile on its N side and to have been allowed to fill naturally over the centuries. Trench 2, 3m to the E, exposed an identical sequence. A S Robertson 1964; A Dunwell, G Bailey, A Leslie, A Smith 2002; K Speller and A Leslie 2002. (Index no. 6836: extends onto map sheet NS47SE). 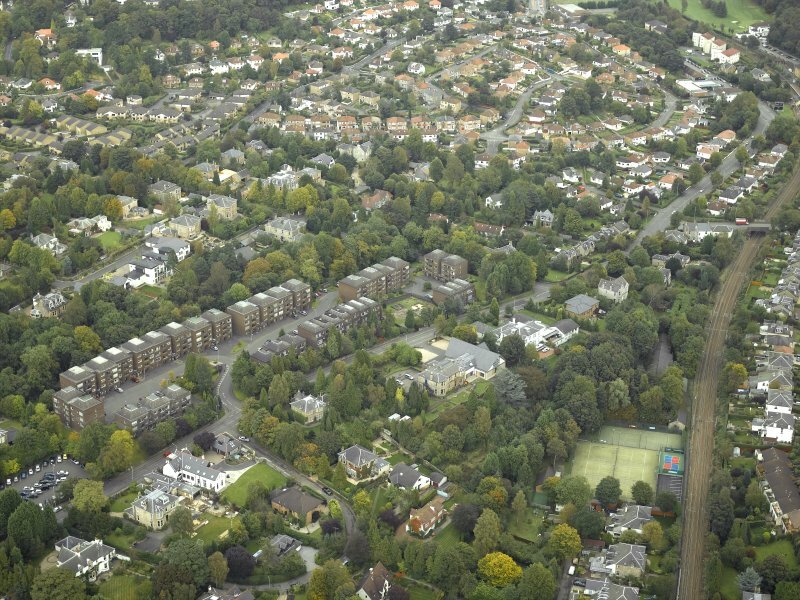 The length of the Antonine Wall from 950m W to 335m ENE of Cleddens is Scheduled. 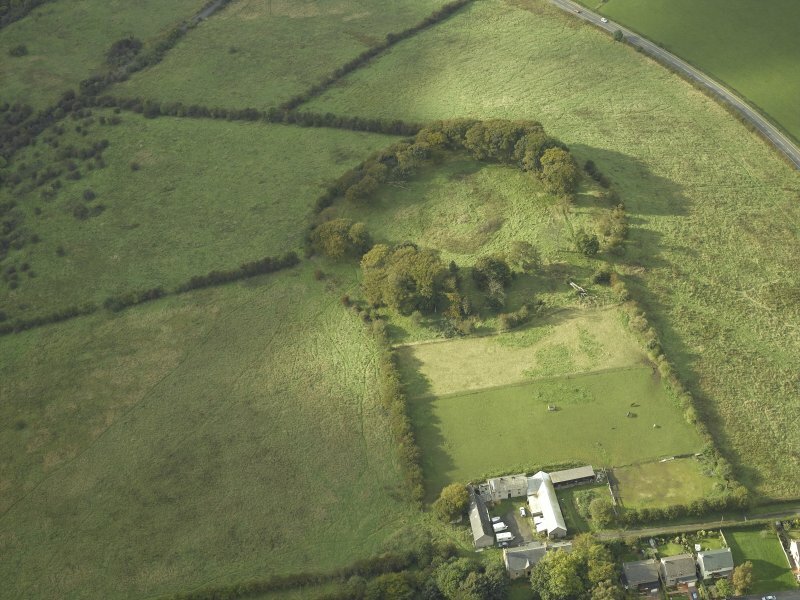 This length survives mainly as buried remains, and includes the site of a fortlet. Traces of the ditch survive immediately E of the buildings of Cleddens Farm [NS57SW 320]. [The attached map indicates that the Scheduled length extends from NS 4987 7229 to NS 5139 7231]. Information from Historic Scotland, scheduling document dated 30 March 2010. Roy maps this section of the Wall. NS 5379 7233 Track of the Ditch is easily followed between Thorn and Ferguston Muir (ONB 1860). NS 8379 7980 and NS 8346 7980. 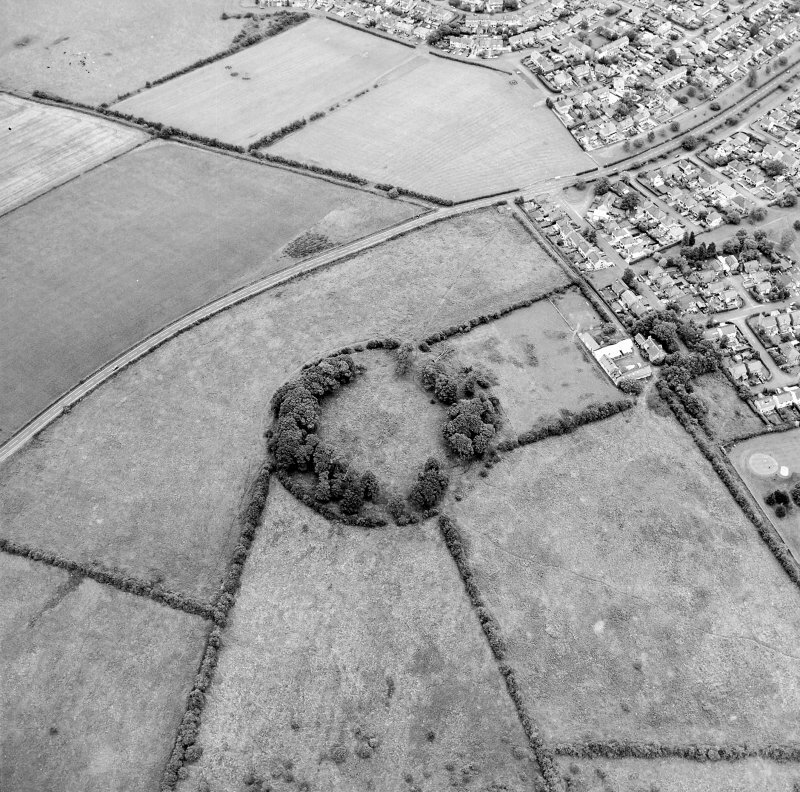 When visited in 1957, the two 'expansions' were roughly semi-circular on plan, measuring about 10.0m E-W at the rampart face by 7.0m N-S, with a maximum height of 1.2m. 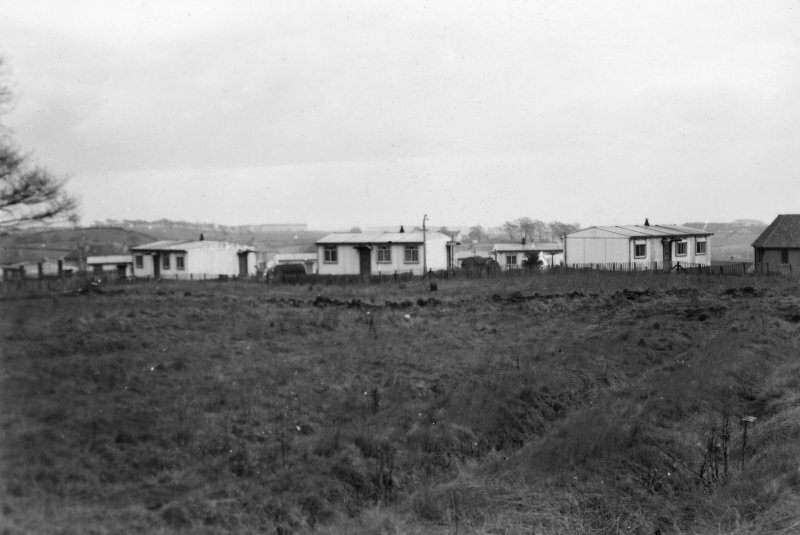 The eastern expansion was excavated in 1957 by the RCAHMS who showed that it had been rectangular, and would have measured about 19' x 10' at a height of 10' above the ground (the estimated height of the rampart). It was formed of turf set on a stone base, the semi-circular appearance being due to the collapse of the weathered turfwork. Considerations of siting and the discovery of burnt deposits of wood, turfwork and Roman pottery in the immediate vicinity of the eastern expansion indicate that they were beacon stances, communicating with the area N of the Wall. K A Steer 1959; RCAHMS 1963, visited 1957. NS 5479 7207 The new line now runs exactly parallel with Roman Road; evidence which further supports Macdonald's (1934) line for the Military Way (see NS57SW65.13). NS 5221 7258 to NS 5235 7270 The published survey (OS 50 inch 1960) was revised. The Ditch, bisected by a hedgerow, is spread to a width of 19m with a North scarp 1.2m high and a South scarp 1.8m high. No trace of the Wall or Outer Mound. Resurvey emphasizes slight alignment angle at NS 5221 7258. NS 5474 7209 SRC carried out a watching brief during excavation of foundation for an extension to the N and E of the existing house at 39, Roman Road, Bearsden. The OS 1:10, 000 map (dated 1985) shows the course of the Antonine wall running WNW to ESE passing the N side of the house whilst other maps held by the occupier and the Hunterian museum, indicate the wall passing the southern side of the house. The foundation trenches revealed a small spread of large stone consistent with the make up of the base of the wall in other areas nearby. There were no traces of kerb stones evident. This feature was overlying a plough soil from which nine fragments of post-medieval pottery were recovered. 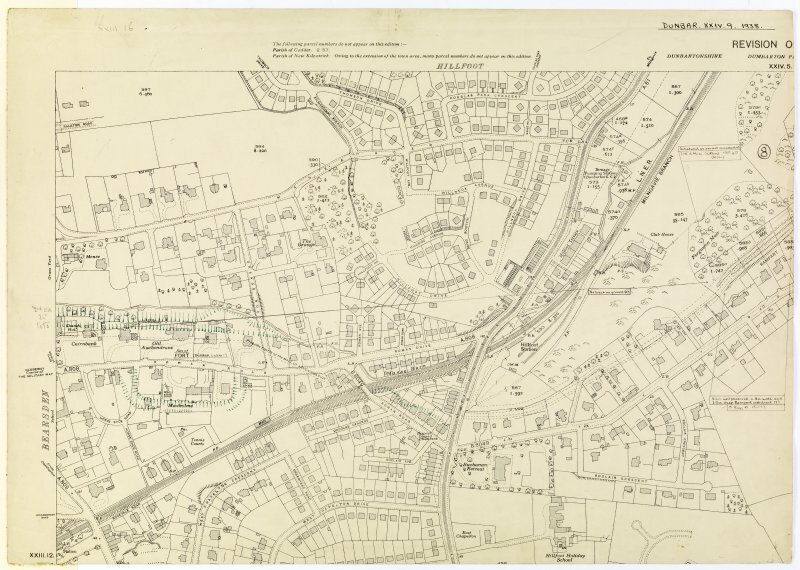 The first edition of the OS maps dated c. 1860 shows the area as fields and it is likely that the plough soil noted in the foundation trenches belongs to this date. The spread of stones may represent clearance from an agricultural field or be related in some way to the construction of the house or its garden. Six sherds of black burnished Roman pottery from two different vessels were found in a garden soil that may have been brought in from elsewhere to level the garden. A full report has been deposited in the Strathclyde SMR. 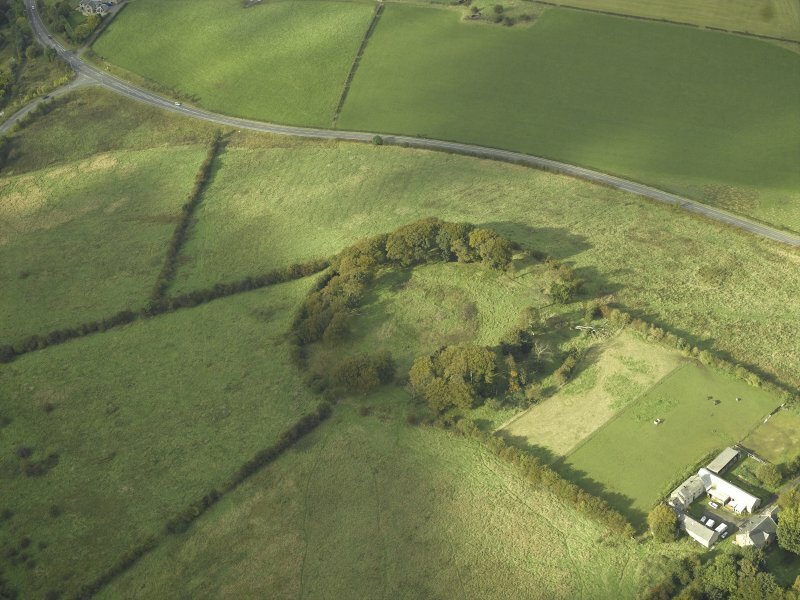 During March 1995, GUARD were commissioned to excavate a trench at the above location before the construction of farm buildings adjacent to the scheduled course of the Antonine Wall. The trench measured 45m by 1.5m and up to 1m in depth and was positioned at 90 degrees to the adjacent scheduled area. NS 543 722 A watching brief was undertaken in November and December 2002 of new drainage trenches around the church (NS57SW 127). Disarticulated human bones recovered were re-interred in the excavation trenches. Archive deposited in the NMRS. Sponsors: HLF, Fabric Committee of New Kilpatrick Church. 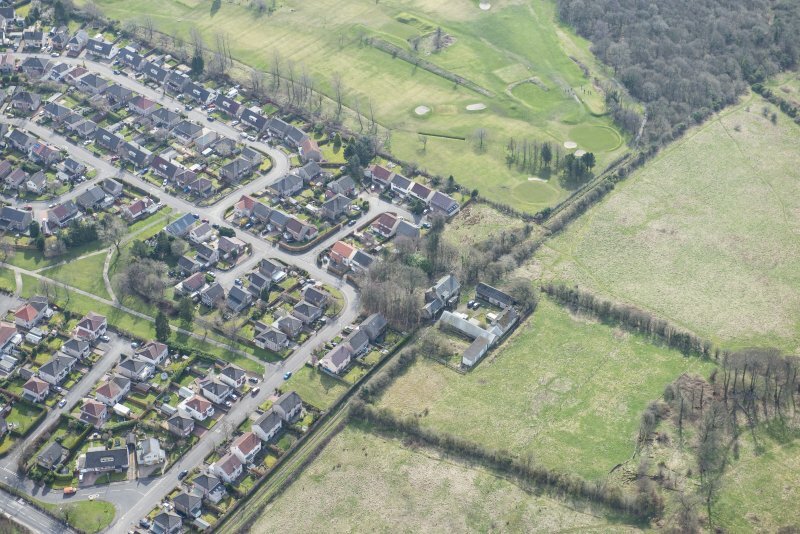 NS 5352 7245 and NS 5353 7245 Two trenches were opened by GUARD in September 1997, ahead of a proposed single house development, to locate and evaluate the condition of any surviving remains of the Antonine Wall. Some indication of the likely condition and characteristics of the Wall at this point was provided by records of an excavation conducted immediately W of the site in 1963 (Robertson 1964) (see NS57SW 65.00 at NS 5336 7244). A small portion of the Rampart base revealed that work can still be seen today exposed on the ground. A Dunwell, G Bailey, A Leslie, A Smith 2002; A S Robertson 1964. NS 9991 9235 Three sites of historical or archaeological significance were identified during work in the study area in March 2011. 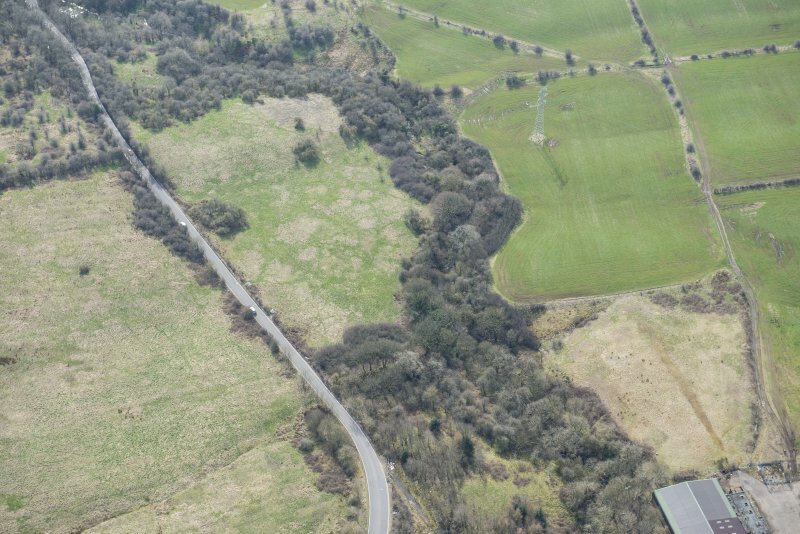 The most significant was the section of the Antonine Wall that was recorded crossing the NW corner of the study area at NS 51447 72309. 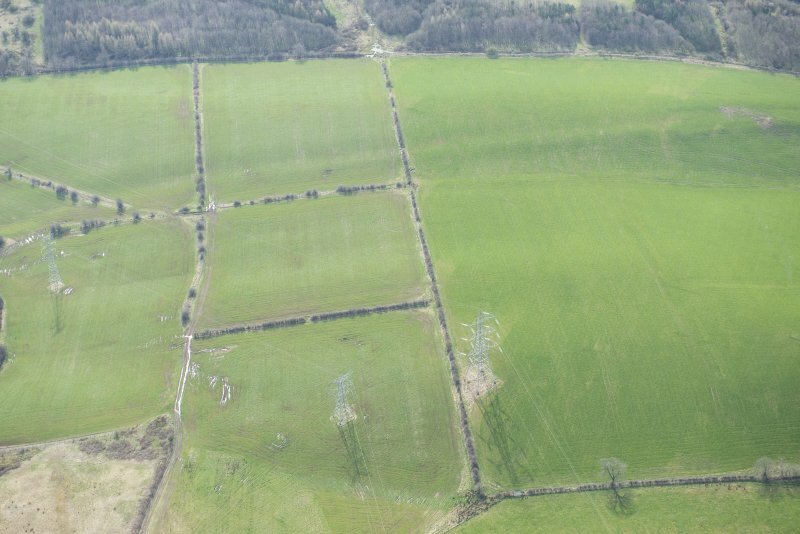 A field boundary relating to 19th-century agricultural use and tramways associated with 19th-century industrial activity were also recorded.